Buzzer is a device which makes a sound by applying DC current to coil to generate magnetism and cause periodical vibration of diaphram. 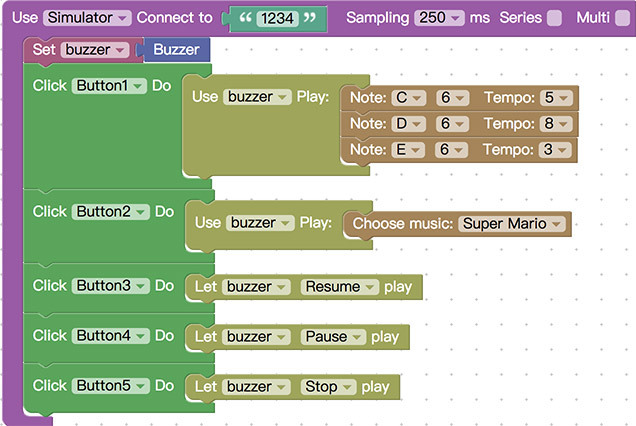 Webduino Bit has an on-board buzzer that can play seven octave tones by simply input note to web pages. Open Webduino Blockly Bit experimental version, place the “development board” block to edit area, the development board uses simulator by default, connect with virtual Bit board as shown in the picture, the preset Device ID is 1234. To use physical Bit board, please choose the “Wi-Fi” in the drop down list and enter the corresponding Device ID. Buzzer related blocks are in the “buzzer” menu. Place the “buzzer play” blocks, and place note and rhythm first, the first drop down list of “note” has “mute,C、CS、D、DS、E、F、FS、G、GS、A、AS、B” options which just like the black key and white key of piano,the options with letter “S” is the black key. The second drop down list is 7 octave options, the higher of the number, the higher the pitch.”rhythm” is how many fractions of one second, the minimum can be 1/10 second. Several notes and rhythms can be placed together to playback in a sequence of their position. Place each note and rhythm one by one takes time and may be troublesome, the alternative way is to use note sequence and rhythm sequence block. If the number of rhythm is less than that of note, the rest of note will be played using the last rhythm in the rhythm sequence. If unfamiliar with musical composition, user can use “music” blocks in which there are five preset melodies. User can also blend the above three methods,play pure tone first and then music and last note and rhythm. Press the red button on the upper right to run, sound will play through earphone or speaker if using virtual board, or through buzzer if using physical board. 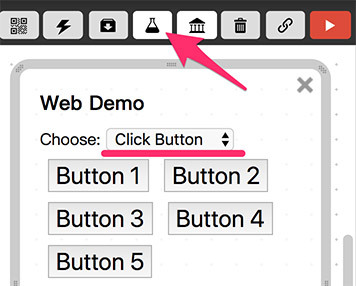 Open the web interactive area, choose the “button action” in the drop down list, several web page buttons display,and corresponding blocks are available on the bottom right. Place “click button ...run” block, and put the music to be played, or put the buzzer control block(pause, stop, continue), to control the action of the buzzer. Special attention should be paid is that remember to place “play buzzer” block.